This topic contains 48 replies, has 9 voices, and was last updated by Cille 7 months, 1 week ago. The next step is to learn to see when that is necessary in advance, before spending a lot of time trying to fix the unfixable. I told myself I was going to take a break from these and then I had a cute idea for Isolt so of course I had to get right on it. Having a picture in your head to duplicate is great until you get to the part where you have to make the angling and proportions work. Arms seem to be my nemesis as far as proper proportions and positioning go, but at least the legs look pretty good. Someone please tell me if there’s a ring or donut shape in the item offerings because building those things out of circles was a pain in the wazoo. The magnifying glasses worked way better for the shield since I didn’t care about making the overlapping bits perfect. I find I spend a lot of time on details, like finding buckles for the leg armor and getting strands of hair in just the right place, but I’ve kind of come to the conclusion that if something annoys me every time I look at it, I’m better off taking the time to make it not annoy me. And eventually I get to the point where I can declare it done enough to post. Never quite as strong, fierce, or good at fighting or smithing as her peers in their hill country community, Isolt was basically the kid who’s always picked last for kickball. After the local priest of Berronar Truesilver took her under his wing and began training her as an acolyte in the faith, she realized that if she could be the best healer ever then the fighters would let her join their hunting parties and sparring matches. Her plan worked, although after so many years of being left out she tends to overcompensate in her eagerness to be useful and appreciated. Eventually Isolt’s mentor decided that it was time for her to get some experience out in the wider world, and she was sent forth to use her divine powers for good and bring the light of Berronar to the world. She treats her adventures as a sort of missionary pilgrimage, and continues to try to impress the people she meets with her prowess as a healer and protector en route to sharing the good news of Berronar and giving the deity credit for her abilities at every possible opportunity. 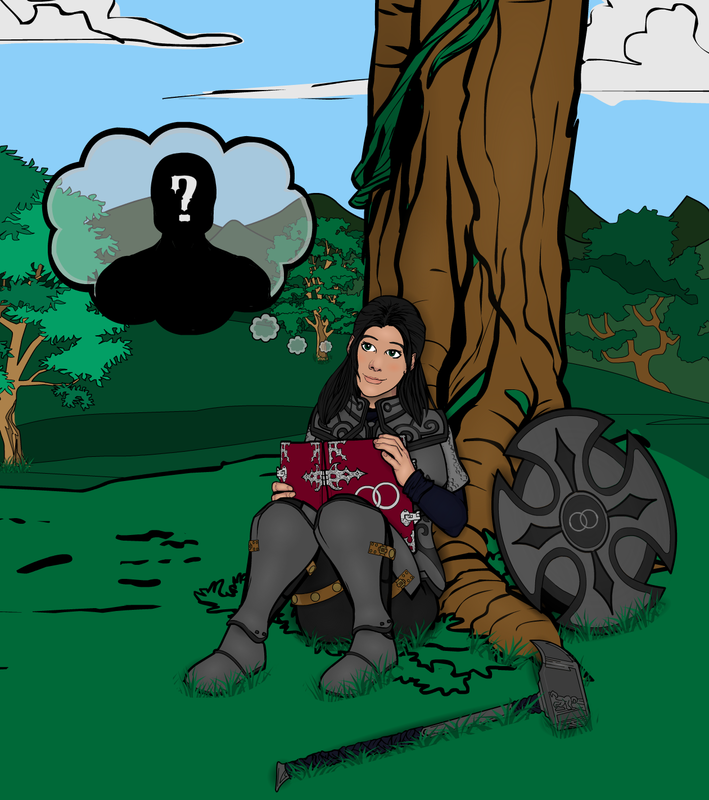 As Berronar’s domain also includes marriage and home, Isolt also yearns for the day when she will find and marry her one true love, and she sizes up every male she meets for romantic potential. She has no idea who Berronar has picked out for her, but she’s sure she’ll find him if she just looks hard enough. Great pose, great grass effect! Just really solid and clean in general. I can’t think of a great ring-shaped item right now. Insignia-Tech does have the metal ring but it might not be sufficient. Ah yeah I think I saw what you’re talking about but the angle was problematic for what I was trying to do. There are a few things in that category that are in the ballpark but have too much stuff I’d have to try to strip out, which sorta defeats the purpose. Maybe I’ll do some testing with those magnifying glasses and see if I can get them cleanly looking like interlocking rings. That might be the closest I’ll get. 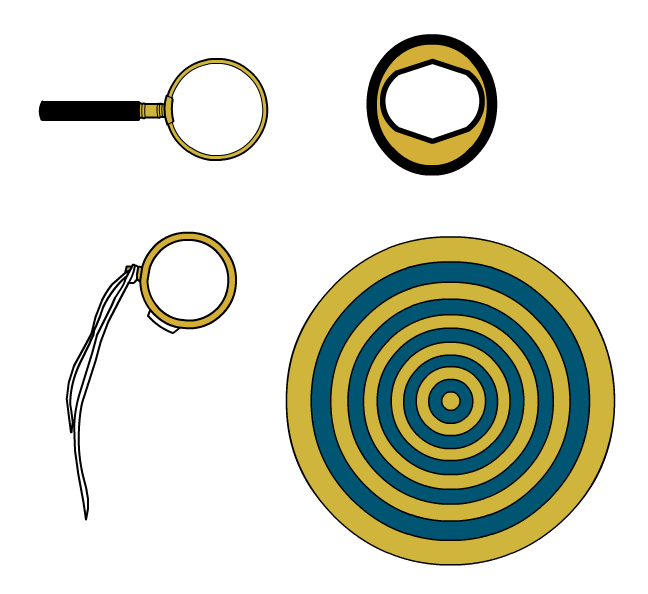 I think I like the monocle best since it would be easy to mask it onto a simple circle shape and get rid of the extra stuff. The magnifying glass isn’t bad either if you can overlook the extra bit there where the handle attaches. The halo would be pretty good in its original form if you were looking at the rings from a steep angle, but trying to turn it into a circle distorts it a lot. And the target rings could work if you used the innermost ring and cropped the rest. I started this one about three months ago wanting to see what I could come up with for the shadow around Mireia’s eyes. I thought I was quite clever using a shrunk-down pointy hairstyle that sort of did the job, but I wasn’t really happy with it so I set the whole thing aside. Upon revisiting the character, I hit on the even more clever idea of using one of the eye items with the solid color in the middle, which gave me just the shape I wanted. With that hurdle cleared, I went on to discover even more ways that the relatively simple wardrobe concepts I envision can become complicated to actually implement using the available assets. (“Shabby, highwater peasant pants with a slight flare at the bottom of each leg” doesn’t seem like it would be that hard, right?) HeroMachine life lesson for the day: If the outline of your object is too thin after you shrink it down, put a slightly bigger version of the object in solid black right behind it. If there were such a thing as a fallen high elf, Mireia might consider herself one. In her old life, the child known as Mira was expected to follow in her parents’ artistic footsteps. But an early fascination with light (and the encouraging influence of her art teacher’s black-sheep brother) led her to become interested in pursuing magic. She was allowed to enroll in a mage academy with the understanding that the diversion would last only as long as she maintained the highest standards in her studies. She pushed herself to become her teacher’s prize pupil, but when a talented newcomer threatened her position of superiority, a rivalry flared up between the two students. The new girl was as fascinated with darkness as Mira was with light, and when Mira began surreptitiously researching the dark arts to try to gain a leg up on her rival, she instead discovered a scope of power that she had never even considered before. When the time came for the students to present their ultimate displays of magical mastery, which would determine their future as mages, Mira stunned everyone by unleashing an unbridled torrent of summoned creatures, both light and dark in nature. But the spectators’ surprise and Mira’s self-satisfaction soon turned to horror as the creatures revealed their true essence – they were in part manifestations of Mira’s jealousy and hostility toward her rival, and they attacked the girl without remorse. Mira was helpless to stop the ensuing carnage, never having gained the discipline to truly master her summoned minions. By the time the creatures were subdued, three students were dead and both the school’s reputation and Mira’s future were shattered. Now a withdrawn shell of a person, her bright eyes permanently marked with the shadows into which she had too deeply gazed, she was sentenced to be executed in a cleansing ritual that would contain any lingering trace of dark magic within her. But when a mischievous interloper left her as the only survivor of an attack on the caravan transporting her to the ritual site – quite probably recognizing that she had already accepted her own impending death – she was confronted with the opportunity to choose her own fate. At first she didn’t care whether she lived or died, but then it dawned on her that she might be getting a second chance to refashion her life and somehow find a way to move past the horrible things she had done. No longer a child, but not quite able to call herself an adult, Mireia moves forward now, more aware of her own abilities and limitations, more mindful of the dangers of uncontrolled magic. She keeps to herself, fearing that her dark past may overtake her at any moment, and secretly yearns to find a place where she belongs. This reply was modified 1 year, 2 months ago by Cille. Ever the alpha male, Rhojhan served as the brash frontman in tandem with his younger brother and wingman Bharash. When a woman came along who interested both of them, and she unexpectedly showed a preference for the more restrained younger brother, Rhojhan confronted Bharash about knowing his place. When Bharash became angry and defended himself, the altercation turned violent and Rhojhan lost control and killed his weaker brother. Refusing to accept responsibility or punishment for the murder, Rhojhan rationalized the entire thing as his brother’s fault for not standing aside. He wouldn’t stand to be condemned by his clan, so instead he left home and struck out to be his own man. He gravitated toward a life on the sea, being constantly in motion away from whatever lay behind him and feeling a kind of kinship with the volatility of the ocean and the chaotic power of storms. When his ship was beset by a horrible storm and wrecked, Rhojhan pulled a crewmate away from a chunk of wood and allowed the hapless man to die in order to save himself. This pleased the storm god Talos, who appeared to Rhojhan and offered to save him if he would agree to serve him as a battle cleric. 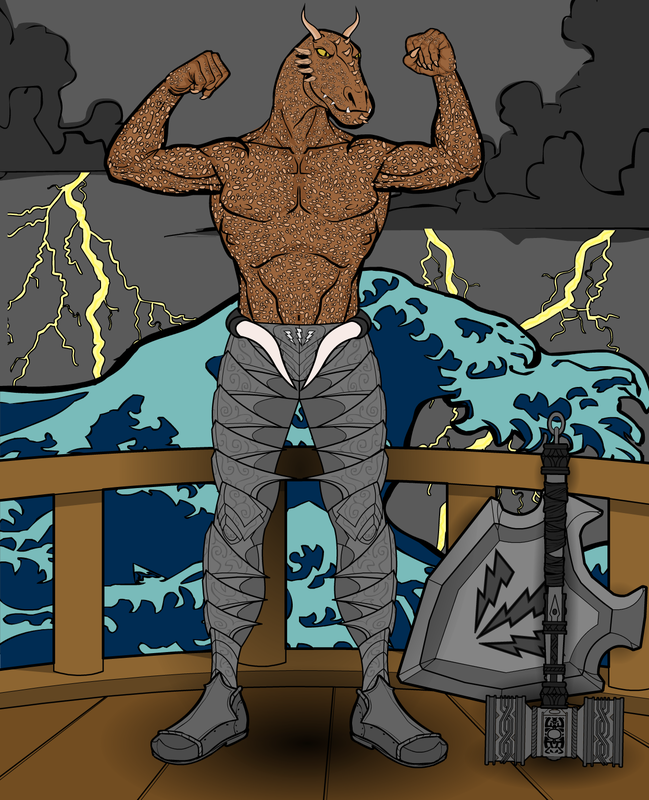 It was an easy choice for Rhojhan to make in the moment, and even after he had made it safely to shore and more thoughtfully considered the situation, he found himself feeling enthusiastic about being an agent of the storm itself. He adopted a new surname to replace the clan name he had already cast off, and has set out to remind the powerful and complacent of their relative puniness in the face of the true powers of Talos and his storm. He envisions himself as the harbinger of lightning and destruction, a warning against foolishly tempting the forces of chaos, a reminder that complacency and comfort can be upended in an instant – just as his old comfortable life was thrown into chaos by one argument. Fantastic, the details you put into your work. I came up with this character just this past weekend, and once I finished with Rhojhan I decided to see what I could put together for her design. I had some basic concepts in mind, and then it was a matter of poking around the available items and picking out things I liked. Considering that I basically had one furry body object to work with, the body elements came together quite well. (I did have to use a non-furry hand to hold the rapier, because arms don’t bend that way, but it’s not like you can tell the difference.) Fun fact: Her muffin top is made of a leg and two shoulders. To hear her tell it, Medusa is an enterprising pirate captain who left home in search of adventure and fortune and would still be living the high life on the open seas if she hadn’t been swindled out of her ship and deserted by her good-for-nothing crew. 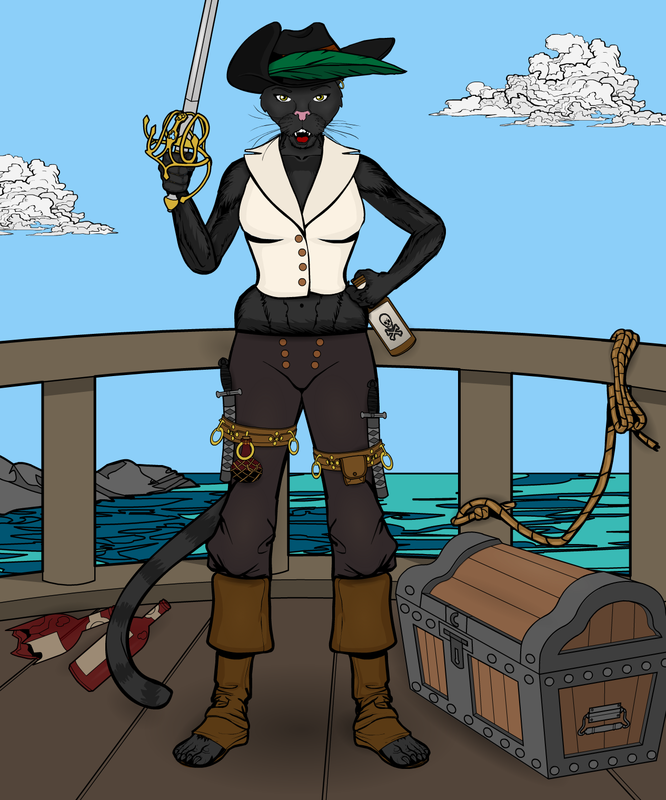 What she wouldn’t tell you is that she was run out of her home for stealing from pretty much everybody, and she lost her ship and crew after trying to swindle a hag (which is never a good idea). So until her fortunes turn back around, she’s living the wanderer’s life, taking what she can get (away with) and letting her bad reputation do (most of) the talking. That cart’s code might need to BE in custom backgrounds–excellent. Your sheep did make me laugh, along with the comment about foliage. I think eventually you’re going to find that sometimes the background, the foreground, the subject, AND the objects can be each others’ foliage. Sometimes that is the only way NOT to spend hours on construction. Working on a piece right now that I planned out on a post-it note with a pen while my littlest posed wearing an impromptu ‘fat-suit,’ holding a twig up like an umbrella. Us artists have to solve our odd problems in odd ways sometimes. Never apologize for bulky backstories. Concision comes with experience, and sometimes the audience needs longer sentences to process good work. Oh, and check out the earring Ears item where there’s a linkage. Build each one into a circle? This reply was modified 1 year, 2 months ago by Herr D.
You know how sometimes you have a concept that sounds pretty good, and then you start trying to create it, and it turns out to be more complicated than you planned, even though you probably should have expected that from the beginning? And you go from working out a kneeling pose that you hope doesn’t look stupid and blending in sleeve bits to constructing not one but three additional characters, all of whom of course need to have nontraditional poses and body angles that don’t exist in the available assets. At least the dragon came in a nice convenient chunk. And then you spend a bunch of time searching for mushrooms and end up making them out of alien heads and combat helmets. And then you need to work out a sky that’s dusk but not too dusk, and shade everything off of a campfire at varying angles, because nothing can be easy. And eventually the whole thing pays off and you end up with a pretty darn nice picture. Trillian was raised within a circle of druids in the grasslands, and upon reaching adulthood she was apprenticed to the caretaker of an isolated nature shrine. When the elder passed away, Trillian began what would become a centuries-long tenure as the shrine’s solitary guardian. Over time she developed the shrine into a kind of rest stop where travelers could find some comfort on their way through the otherwise uninhabited wilderness, and her habit of taking an animal form when visitors stopped by led to a local legend of an animal spirit who guarded the shrine. Not far from the shrine was a spot framed by fairy rings where a portal to the Feywild would sometimes appear. Although Trillian had many times been tempted to venture into the Feywild, her devotion to the shrine always prevailed. 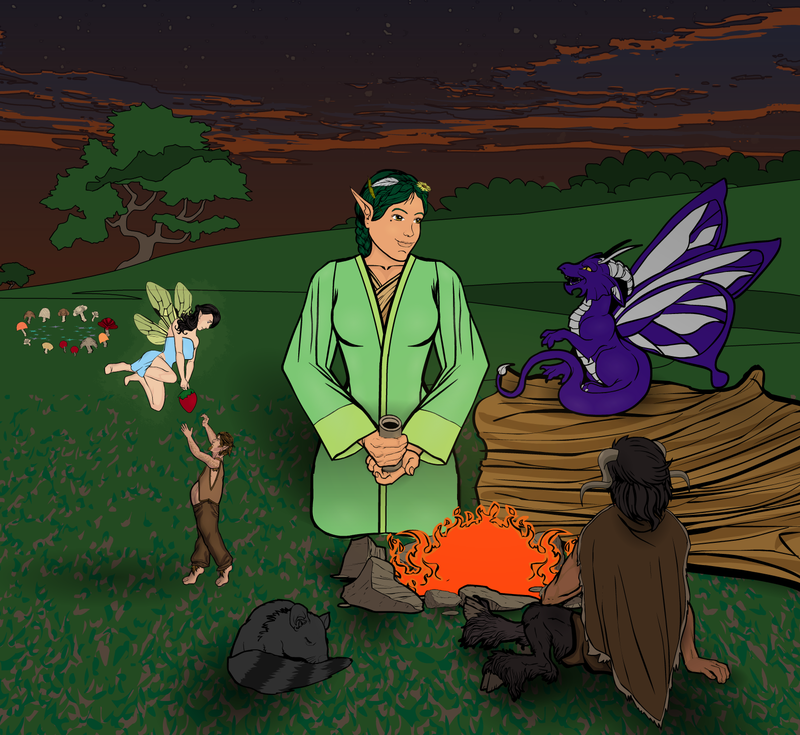 The portal allowed her to meet some of the fey denizens of that realm, though, and she had made many friends over the years. Shortly after her 400th year at the shrine, calamity struck. A malignant force emerged through the portal and attacked the shrine, intent on obtaining a powerful artifact housed there. Trillian was powerless to prevent the destruction and desecration of the shrine, but she was able to escape with the artifact thanks to the intervention of her fey friends. They ushered her to safety within their realm, where she remained for some time before deciding it was time for her to return to “her” world. 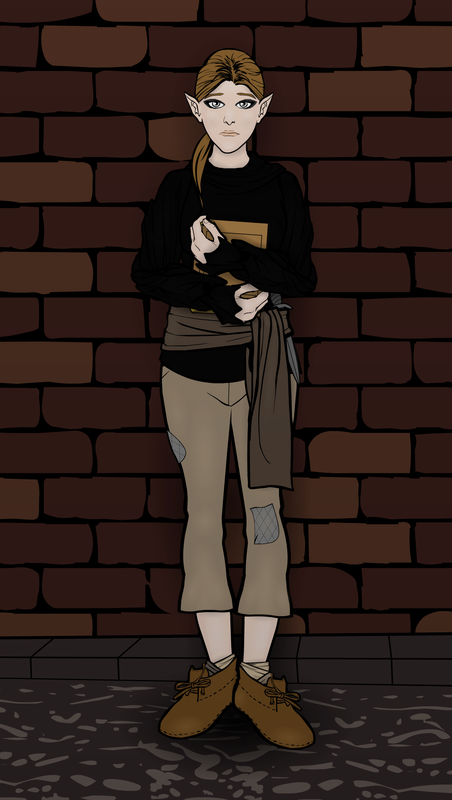 At something of a loss now that her purpose in life has been destroyed, she is currently seeking a new purpose and continuing to try to protect and keep secret the artifact she carries with her. This reply was modified 1 year, 1 month ago by Cille. I like that. The colors of the sky are great, the pixies and the opossum are cute and the fairy ring is a nice touch. The backward-facing satyr is brilliantly done. There’s a slight problem with a lack of depth to the background, meaning that the pixies, the fairy ring and the main scene seem like separate scenes having been placed on a flat plane rather than one big whole. I have no easy trick for fixing that, though. Another thing is that Trillian’s arms and hands seem a bit large, probably a perspective issue but I find it hard to ignore. Still, I really dig this. I appreciate how her background gives the image a slight tragic feel. I would suggest to leave the sleeves oversized, but put twist-wrinkles on the forearms and add small sleeve-yawns for a more 3d look. Then it becomes foreshortening rather than a scale issue.